Many of man’s technological marvels are not really invented, they’re discovered. Certain technologies are inevitable for humans to develop. If the heroes of science and technology didn't get it done when they did, it would have been just a matter of time before some other brilliant person came along and found the telephone, the light bulb, or the automobile for example. Things would probably not have turned out exactly the same if someone else discovered them first, but for the most part they would be indistinguishable from what we have today. Both discovery and exploration are nothing but races to see who gets to the finish line first. Very little is truly “before its time.” It takes the right person, armed with enough of the appropriate technology, at the right time in history to make a find. Guglielmo Marconi didn't discover electromagnetic waves. He didn't even discover radio. He was the first to make it practical. Marconi lived an extraordinary life steeped in the history of his day. Marconi was born on the 25th of April, 1847 in Bologna, Italy to a wealthy Italian land owner Giuseppe Marconi and his wife Annie Jameson. Annie was the granddaughter of Jon Jameson the famous Irish whisky distiller. Marconi did not do well in school but his mother supported his interest in Heinrich Hertz’s work with electromagnetic waves. She arranged for Guglielmo to study with a neighbor, Augusto Righi, who was a physicist at the University of Bologna. Over time, Marconi’s experiments yielded several firsts including the transmission of a radio signal across the Atlantic Ocean. His developments led to wide spread use of radio telegraphy, ship-to-ship, and ship-to-shore radio communications that had lifesaving and military implications. 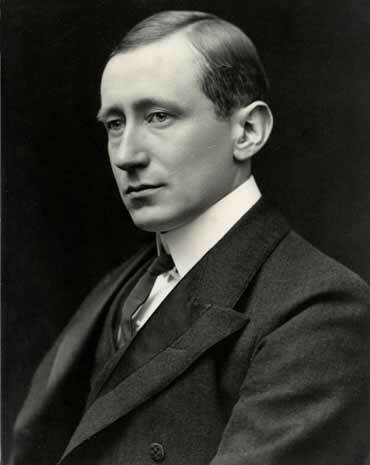 In 1909 Marconi was honored with the Nobel Prize for Physics for the development of wireless telegraphy. In April 1912 Marconi and his wife booked passage for a trans-Atlantic voyage on the RMS Titanic but their plans fell through. Marconi’s wife remained at home canceling her trip all together and Marconi ended up sailing three days earlier on the Lusitania. The Marconi's just barely avoided the maiden voyage of the ill-fated Titanic. After the Titanic disaster, Britain’s postmaster-general had said, “Those [Titanic passengers] who have been saved, have been saved through one man, Mr. Marconi and his marvelous invention.” Marconi narrowly avoided disaster a second time in April 1915 when he again sailed on the Lusitania. On her very next voyage she was sunk by a German U-boat in an act that helped push the United States into World War I.
Marconi was made Honorary Knight Grand Cross of the Royal Victorian Order by King George V of the UK and given the title Marchese by King Victor Emmanuel III of Italy. With all the fame Marconi attained it is said he remained a humble man. He remarked to his daughter, "Do you hear them talking of genius Degna? There's no such thing. Genius, if you like to call it that, is the gift of work continuously applied. That's all it is." Guglielmo Marconi was a very interesting man. Interested in the details of Marconi’s life and the early days of radio? See the links below.